Genuine Fender American Vintage Jaguar/Jazzmaster tremolo arm. Made in USA. Fits American Vintage reissue and original vintage Fender. 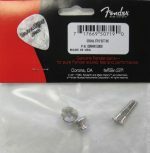 Tip sold separately (uses Stratocaster arm tips with 10-32 thread size).